DIRECT TREATMENT TO THE UNCONSCIOUS MIND. In the 1930's it was discovered that nitrous oxide could cause a mental state similar to states induced with hypnosis. If this is the case it is the physiological aspect of a treatment that has a potential for correcting the compulsive behaviors that plague our society. A psychologist/hypnotist confirmed this treatment resulting in my request to the California State Department of mental health to give permission to Santa Barbara County Mental Health Department to administer "experimental treatment to the unconscious mind. 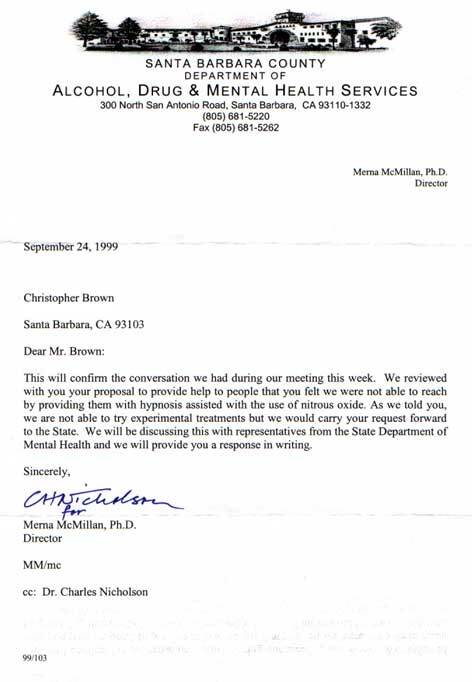 Here is a letter stating that my request would be carried to the state by Santa Barbara County Mental Health and that I would be informed of the states response.